1. MC3-160 156 - 162 MHz. 6 MHz. 3 dBi. 2. MC6-160 156 - 162 MHz. 6 MHz. 6 dBi. 3. SD12-160 155-165MHz 10 MHz 12 dBd. 7. AC7-156-162 156-162 MHz 6 MHz 7.5 dBi. Marine Antenna manufactured by Antenna Experts are highly suitable for Global Maritime Distress and Safety System (GMDSS) communication equipments used to increase maritime safety and make it easier to rescue distressed ships, boats and aircraft. The GMDSS system is intended to perform the function of alerting (including position determination of the unit in distress), search and rescue coordination, locating (homing), maritime safety information broadcasts, general communications, and bridge-to-bridge communications. Antenna Experts ADY-156-162 dual stacked yagi antenna design reflects innovative modern antenna construction and designed to increase 3dBi gain in same direction wheres ADYS-156-162 dual stacked yagi antenna to increase the coverage in different direction which can be installed in two different directions to cover a wider sector or in back to back configuration for bi-directional coverage. The dual stacked yagi antenna is supplied with a stacking pipe, power divider and phasing harness cable as standard accessories. The AC7-156-162 is a marine band high gain fiber glass collinear antenna and designed to provide 7.5dBi gain over entire marine band 156-162 MHz. The high gain marine band collinear antenna is supplied in two segments for easy of handling and shipping and can be assembled in the field without any hand tools. The SD12-160 ultra high performance VHF AIS marine band stacked dipole array is specially designed as AIS base station antenna for AIS Automatic Identification Systems covering entire VHF marine band. The SD12-160 is heavy duty AIS stacked dipole array features, wide bandwidth, high gain, high power handling capacity, low VSWR, low noise performance and null filling coverage with omni-directional characteristics. The SD12-160 AIS stacked dipole array maintains constant gain and VSWR over its 10 MHz bandwidth, making it highly suitable as base station antennas for AIS automatic identification systems used on ships and by vessel traffic services (VTS) for identifying and locating vessels by electronically exchanging data with other nearby ships, AIS base stations, and satellites and any other multi-channel communication systems. The wider 180 Degrees horizontal beam-width with high gain features making the AIS antenna highly suitable for Oceanic Information Region to control the inbound and outbound Oceanic traffic. The SD12-160 AIS antenna system is a VHF radio broadcasting system that transfers packets of data over the VHF data link VDL and enables AIS equipped vessels and shore-based stations to send and receive identification information that can be displayed on an electronic chart, computer display or compatible radar. This information can help in situational awareness and provide a means to assist in collision avoidance. AIS can be used as an aid to navigation by providing location and additional information on buoys and lights. These MC series omnidirectional marine band whip antenna covering the entire VHF General Marine Band 156-162 MHz. with 3 dBi and 6 dBi. gain. The marine band antenna does not required any groun plane for normal operation. The MC series VHF marine band omni-directional Collinear Antenna is rugged all weather model uses high class brass and 6063T6 aluminum alloy and does not require any field tuning or adjustments. MC10-156-162 VHF Marine Band High Gain Fiberglass Omni-directional Collinear Antenna is rugged all weather model uses high class brass and ultra corrosion resistant architectural aluminum alloy and does not require any field tuning or adjustments. The MC10-156-162 marine band high gain collinear antenna is a center fed design which eliminates the distortion of the radiation pattern and ensures nearly a true omni-directional horizontal pattern. The special stub matching is used for smooth VSWR and constant 10dBi gain over the 156-162MHz marine band. 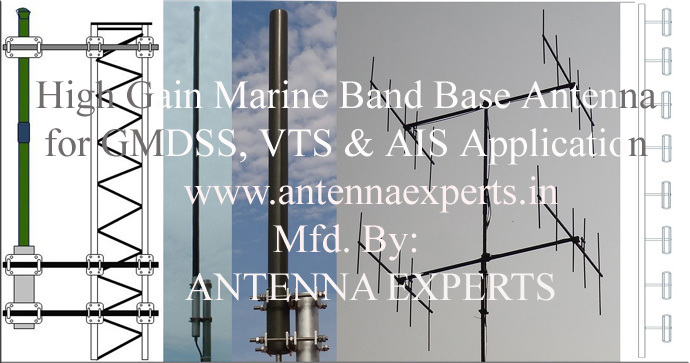 All junctions of marine band antenna are fully welded to prevent RF inter-modulation and antenna is completely protected within a high-tech ruggedized ABS or Fiber glass radome to ensure survivability in the worst environments. The ABS or Fiber Glass enclosure has excellent transparency for RF signals and enough strength to withstand specified wind loads. The MC series marine band collinear antennas are center fed design which eliminates the distortion of the radiation pattern and ensures a true omni-directional horizontal pattern. The special stub matching is used for smooth VSWR and constant gain over the entire marine band. The marine band collinear antennas are consist of large diameter brass radiating elements stacked vertically, fed in phase. The marine band antenna termination is enclosed at bottom of the antenna for complete weather protection. The marine grade stainless steel mounting hardware is supplied with the marine band antenna. Marine band antenna can be supplied with 2 ways or 4 ways ratchet mounting hardware to enable the user to mount on the deck or on the side of wall.